Ancient cities, spectacular coastline, world-famous historic sights and plenty of pasta, there are oodles of things to see, eat, photograph and do in Tuscany with kids. Here are nine things to do in Tuscany with kids, all of which make excellent day trips from Park Albatros. *Disclaimer: This article contains some affiliate links, any purchases you make are unaffected but I may receive a small commission at no extra cost to you to help me keep this blog running – thanks. High on a hill, surveying rolling Tuscan coastline and a vast expanse of ocean from its ancient perch, sits the old Etruscan city of Populonia. Turn off the air con and open the windows as you climb the winding, wending road upwards and listen to the sound of the singing cicadas for maximum holiday vibes. The car park at the top has one of the best views around and is a great spot for sunset viewing. Butterflies flitter beneath the castle ruin during the day, cypress trees dot the hillside and age-old walls envelop a charming stone town – this is Tuscany pulling out all the stops. Inside its 15th century walls, discover paved streets with little shops selling art, jewelry and clothes, delightful restaurants and the impressive castle. Entry to the castle is around €2.50 per adult and is definitely worth a gander with kids – just watch out for little ones on the steep narrow steps, you’ll need to do some funky manoeuvres to carry them up. Your endeavours are rewarded at the top with breathtaking views over terracotta rooftops and the sea, all the way to the Island of Elba. Nowadays only a handful of people live in Populonia, but it is possible to rent a holiday apartment with stunning sea views. Two things immediately come to mind when visiting the Leaning Tower of Pisa – a) how much the Tower actually leans and b) how has it survived like this for over 800 years?! Visiting the Tower of Pisa has been on my travel bucket list since I was a bairn and confused it with ‘The Leaning Tower of Pizza’. 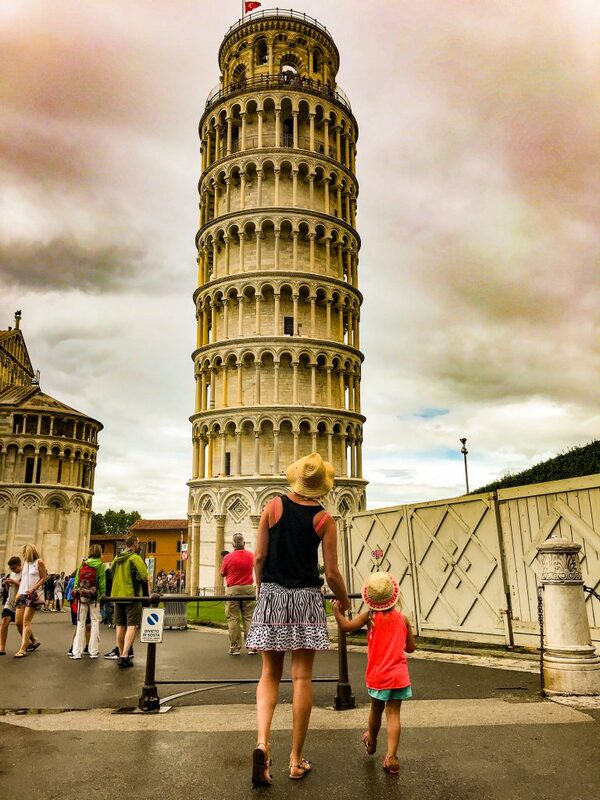 With the city of Pisa just an hour away from San Vincenzo, visiting this world-famous tourist attraction is a surprisingly easy sight-seeing day out with kids. If you’re driving, you can park for free in a large parking area, about 8-minutes from the Tower called Parcheggio Via Pietrasantina (where the tourist buses park). However if – like us – you are just stopping by for a few hours with young kids, there are roads running right next to the Piazza dei Miracoli where you can park very cheaply. Under 8s aren’t allowed to climb the tower, but wandering around the spectacular Piazza dei Miracoli, with its immaculate lawns and even more ancient Cathedral and taking the obligatory ‘holding the tower up’ pose was enough to entertain the little’uns. There’s also a museum opposite and souvenir stalls dotted around should you feel so inclined. Pisa was also the spot for one of our best meals out in Tuscany – just a few minutes walk away from the Tower is a little Pizzeria, Al Bagno di Nerone, at the end of Cardinale Maffi (just in front of the city walls’ gate. Extremely family-friendly, the staff remained unflustered when our group of eight – dripping wet, buggies blocking the way and wired pre-schoolers in tow – entered their building, instead welcoming us with smiles and introducing us to ‘Cecina’, a delicious traditional Tuscan chickpea-based ‘flatbread’. As an extra bonus it’s also easy on the wallet – with lunch costing just €60 for eight. Easily accessible by bike or car from San Vincenzo, beach botties will adore this golden-sanded beach, tucked away behind a grassy green field and Mediterranean pine forest. The beach’s calm waters are great for children and there are pedalos dotted in the sea for when the kids aren’t putting you through your sand-castling paces, or should you not want to mooch on a sun lounger (available to hire in front of a small beach bar). Try and avoid on a Sunday when the beach is swamped by Italian weekenders. A vintage kiosk, Al Polpo Marino serves fresh octopus in a charming spot nearby, another cliff-perched restaurant overlooks the sea, but has a slightly more formal vibe that we didn’t think was going to fly with our crazy kids, or pack a picnic to eat under the shady pines. At the foot of the hill leading to Populonia, slightly further along from Bagno Baratti is a smaller scrap of beach, laden with sandbags. From the road, a gently sloping grassy hill from the road leads down to this thin beach line. The draw? A wide stretch of knee-deep water that makes for perfect toddler paddling. Fish flitter beneath the surface and are easily spottable in the clear, warm waters, boats bob in the bay and forested hills surround this beautiful Gulf. A car park and shady cafe sit on the opposite side of the road, for a cold post-beach beer. Lovely. Holidaying with children involves a lot of kid-appeasing activities, so it’s nice to throw in a bit of adult-minded entertainment. And it’s hard to beat a bit of wine tasting, encircled by cypress trees in a picturesque, award-winning vineyard in Tuscany for a parent-friendly treat. A very laid-back winemaker at Tenuto Poggio Rosso lead the tour through olive trees and vines and once the kids had been run ragged outside, the fragile objects removed and iPads brought out to tame them, we got on with the serious business of drinking. Exquisite white wines (totally converted to Viognier now), rich reds and a dessert wine were dished out alongside cheeses, meats, crackers, home-made chutney and their own olive oil. A wide, flat cycle path runs along one side of the road for several kilometres between San Vincenzo and Park Albatros (and a wee bit further). Shaded mostly beneath the pines, it’s perfect for pottering along with the family at a friendly pace, darting off to discover numerous beaches, or tackling as part of a more serious cycle route. If you’re Baratti bound, the cycle path runs out near the first pebble beach and from there it’s a gentle saunter before a steeper climb alongside light traffic. Just be warned, if cycling at night, there are no street lights in the area – take bike lights! Michelin-starred chefs from Rome left their city lifestyle and set up in the quiet, slower-paced Populonia. Antonio, the owner, is a charming host and comes prepared with colouring for the kids and Prosecco for the adults – genius! His wife is to thank for the sensational pasta – a simple Pecorino and cracked black pepper sauce was delightful and her fresh pesto, home-made pasta dish coaxed our fussiest young eater to wolf the lot. If you can manage pudding before the kids leg it off down the cobbled car free street (or perhaps yours actually sit at the dining table…) then be sure to grab a pudding – the Limoncello meringue bombe and chocolate pud were out of this world. 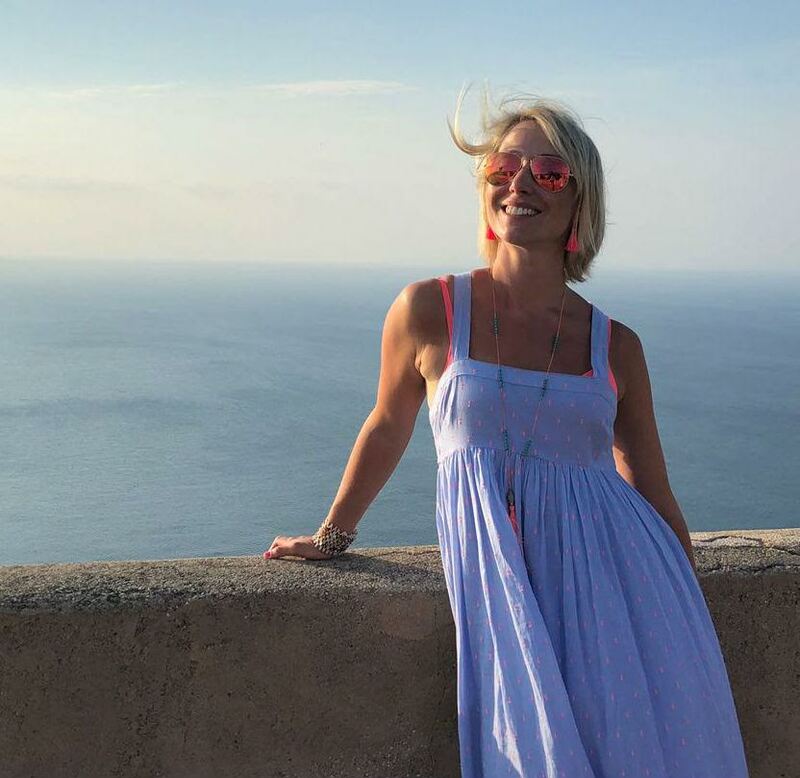 If you’re looking for somewhere to stay near San Vincenzo, Tuscany with kids near to these attractions, you can’t go wrong with Park Albatros – read my mini guide here – be warned though, it’ll make you want to book straight away! Last-second mum-to-be mini break: the Labour-cation! Lovely post and gorgeous pics! I spent a year at Pisa uni so I always love hearing about people’s adventures in the city. Sounds like you had the perfect holiday. Oh I’ll have to put that on the list for next time! Okay, first, you guys are adorable. Second, when I first think Tuscany, I don’t think “kid friendly,” but now I can’t wait to take my kiddo to and do some of this! Thank you! Yes, you definitely should! pinned for our italy trip (hopefully next spring) I have been many times, and had no idea about that beach! def want to head there!